It's amazing to think how far Louise Burns has come as an artist. She's left her Lillix roots behind and made herself a well-respected voice in the Canadian indie music scene. Now the Vancouver singer tries to entrench herself further with the release of her new album The Midnight Mass. 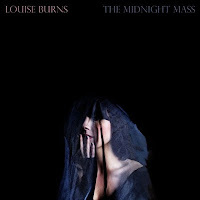 Burns recruited an impressive line-up of guest musicians to lend their talents to the record, including members of Brasstronaut, Dum Dum Girls, Cat Power, and Ladyhawk. The results are mixed however. The album has a very promising opening. "Emerald's Shatter" is elegant, with a maturity that we haven't yet seen from Burns. It's nearly bookended by "The Lodger", a bold track that deftly balances beauty and squealing feedback. Too much of The Midnight Mass sounds like other musicians though. The slick "Ruby" could easily be mistaken for late-era Liz Phair. The dark number "Heaven" has a Mazzy Star vibe to it, while the even darker "The Artist" rumbles until it explodes into a defiant refrain .The hollow production and '60s pop sound of "Don't Like Sunny Days" is straight out of the Best Coast playbook. The ominous and twangy "He's My Woman" would fit seamlessly on Neko Case's Furnace Room Lullaby. None of those songs are bad, but Burns could do more to carve out her own sound. The only true whiff on the album is "San Andreas". It's a synth-heavy, mid-tempo number that's devoid of both soul or destination. Best tracks: "The Artist", "The Lodger"